• Do most of the guests know each other? If most of your guests will be meeting each other for the first time, plan a fun way to introduce them. This will help get the event off to a good start. • Will this be a formal or casual couples shower? If you're planning a sit-down dinner, that may be enough on it's own. You might decide that one simple activity is enough. A casual couples party makes including games, easier. Then you can choose by the number of guests and your time frame. • Are guests in the same age range? Having mixed genders means coming up with ideas that can be used for both. Inviting a variety of ages, means coming up with entertainment that is suitable for all. Simple ideas are often the best. 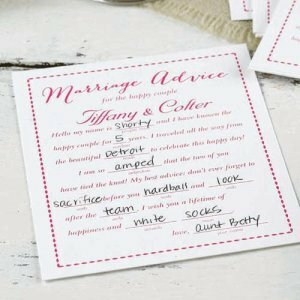 • There are a variety of coed bridal shower games when choosing for a mixed guest list. The choices below are just some of the many fun ideas. Select those that suit your party plans. 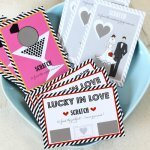 • Wedding Themed Scratch Cards: these can be personalized with a special note. This is a quick fun choice with only one winner. Who will it be? 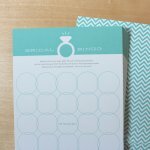 • Wedding Ring Bingo: let your guests fill in the blanks with gift ideas that they think the bride/couple will receive. Play like regular bingo using one row or the whole card. Who will call "BINGO" first? 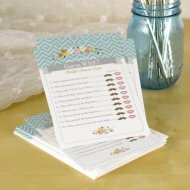 • Conversation Starter Place Cards: this is a great way to involve your guests. Let your place cards serve double duty with the name on one side, and a fun question on the other. • How well do you know us? Make up ten general questions ahead of time, such as "What is your favorite color"? Give questions to the couple, and all guests. Everyone answers the questions. In one column the answers will be for the bride-to-be, and in the next column, guests will answer for the groom. Next, the couple will each give their individual answers. The guest with the most correct matches to the couple, wins. • Who will we be? Make up ten questions about how the couple will be ten years from now. For instance, "How many children will they have"? Have all guests answer the questions on the paper. Then have the couple either write down or directly answer each question, as a pair. The guest who matches the most answers, wins. *** If you are going to give prizes, remember to choose items that would work for a male or female, and for a variety of ages if you have a mixed range. Bridal Shower Ideas and More Newsletter is our way of saying "thank you" for visiting our site. You will receive FREE information, to keep you up to date with the latest trends. I promise to use it only to send you Bridal Shower Ideas and More.